Shadows of Doubt DevBlog #2: Finding the Game – ColePowered Games Ltd.
Shadows of Doubt is a detective management/simulation game set in a procedurally generated and fully simulated city. As head of the police detective department, it’s your job to organise your sleuths and track down AI serial killers before they strike again! Read previous dev blog entries here. Hi all! In this 2nd development blog installment, I’m going to talk about the project’s development during the past year or so; the problems, how I’ve overcome some and am still battling others. Truth is the development of this game so far has been tough. 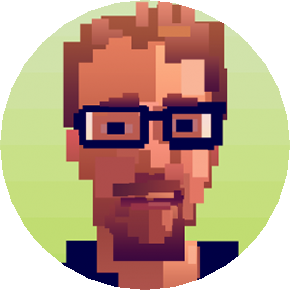 With most games you can develop mechanics and test them in a reasonable amount of time, from there you can start to hone and adjust until you have something playable. At this stage, you can be reasonably comfortable in what you have and proceed to add art, sound etc. With Concrete Jungle I had a pretty good prototype ready in a matter of months (admittedly after a long time trying different ideas), and something representing the final game quite accurately by the time I did the Kickstarter. 1) A whole city of citizens to play out their simulated lives. The game needs ways of ‘recording’ what happens, so the player can uncover evidence at a later date. I’ve got in-depth plans for this. The big one to tackle first being citizen memories/eyewitness accounts – who’s seen who, when, and where. This is actually a huge amount of data for the game to process, as it needs to record everything. 99% of the stuff it’s recording will never be seen by the player because chances are they have absolutely no reason to question Mrs Rogers, 83, living at Sycamore Terrace with her cat Percy. There’s probably no reason to uncover her credit card accounts or rifle through her trash. But the game needs to simulate it anyway because it’s all about open-ended possibility. There’s that famous 3D open-world game notion; if you see a mountain in the distance, you can go there in person. In Shadows of Doubt, if you see a person in the distance you can go dig up a mountain of information on them. The citizen simulation aspect of the game is working to a decent standard (this has been a large chunk of development time). 2) An AI killer to commit a murder -preferably with some kind of motive. They need to have some evasive ability (ie lie to cover up where they were should they be questioned). Right now nobody lies, so if you happen to question the killer, they’re like “oh yeah I was there, I totally killed them”. 3) A simulated citizen to find the body and report it. This one is pretty self-explanatory. Its initial implementation is basic and works about 75% of the time- because right now it’s possible that a killer will kill someone living alone (sorry Mrs Rogers), and nobody will ever find the body. In earlier builds, I overlooked that the killer could ‘find’ the body, which resulted in them reporting the crime as soon as they’d killed them. Combined with the inability to lie, this made for one very easy detective game! 4) It needs at least a semi-functioning management system where you can assign detective teams. This is where the player’s decision making starts to surface. 5) It needs an orders system which allows the player to interact with the world and the citizens. Eg. Questioning to see who a citizen has seen recently, where and when. Basically a way of gathering information, as well as other resources. 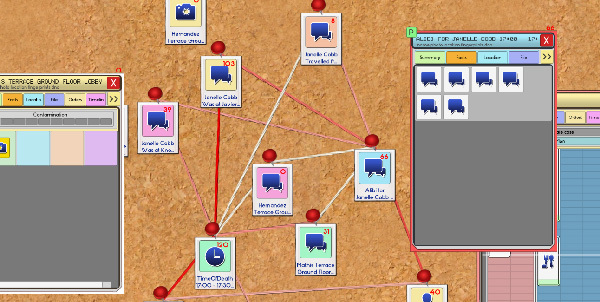 The classic evidence & string interface makes an appearance– just like in real life, it’s the best way to visualize connections. At the moment it’s a bit overly-complex and messy– it needs streamlining. 6) The game needs to introduce constraints and challenges to keep decision making relevant and interesting. This is something I’ve had to learn about through trial and error in previous game development adventures. Choosing who to question next doesn’t mean anything if you can just question as many people as possible with no consequences. Introducing constraints is the key to making those decisions mean something. The core one is time; citizens’ memories are constantly getting fuzzier, and public opinion may turn against you if the killer strikes again. 7) It needs a compelling hook to keep the player playing. In this case a progression system. Usually, the progression will work to ease the above constraints in some fashion, but in a way that makes progress feel real when in actual fact it’s more or less in-line with the game’s difficulty curve, giving somewhat of an equilibrium effect. 8) There needs to be peril. This is somewhat of a personal preference, but in most of my favourite games, there is always something important to the player at stake. Usually a risk of death of one or more characters that the player has been working hard to progress. In a game about catching murderers, it makes sense to have that risk of your agents dying- but the implementation is tricky since you aren’t directly controlling any combat/dangerous scenarios. One of my first instincts early in development was to have an ‘apprehend’ stage of the game where the aim was to capture the suspect- perhaps via a turn-based tactics minigame or similar. While that would be really cool, I feel like this is too big a commitment for an already ambitious project, so I’m going to have to find an alternate solution. I’m not sure what yet. Maybe the threat of citizens being murdered is enough. What I absolutely don’t want is have a risk of losing an agent without any input from the player- there’s nothing more infuriating than losing a favourite character because of RNG. Once I have all of the above functioning, I have my game. It’s probably a bit naive for me to think this is as challenging as game development gets, but it sure feels like it! It’s #7 that’s got me thinking recently- is the real hook of this game going to be the management-style progress system? Or is the hook simply the emergent story of the cases and ‘whodunnit’? Is it both? The plan was always the former, partly because even though procedural generation fascinates me to no end, I was not confident enough in it (arguably my implementation of it) to depend on it to tell compelling stories. Ideally, you’d still have fun managing your department even if some of your cases are super straight-forward and have no twists and turns. It’s still my plan to depend more heavily on the tried-and-tested mechanics of the management genre for the core experience, but as the emergent cases have been occupying so much of my time it’s impossible not to at least hope that they will add a lot to the experience. We’ll have to see. Despite the above sounding probably way-too-ambitious for a small team, yet alone a sole developer, I’m having so much fun making this game! It is slowly getting there– at a snail’s pace, but it’s still going to take a little while longer before I’m truly glimpsing the light at the end of the tunnel in terms of playability. It’s more like everything is slowly coming into focus.